Promoting our value of Sevice, the Pi Gamma Chapter of Phi Gamma Delta has become involved in a variety of philanthropic endeavours, dedicating time and raising money for important causes. 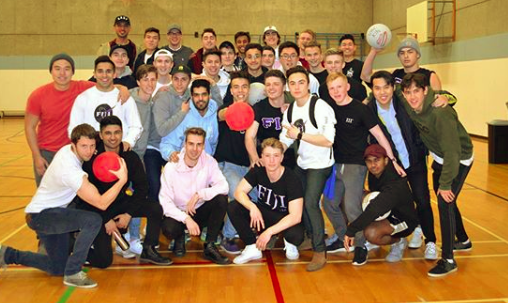 Most recently, the chapter held its 1st ever "Dodge the Stigma" Dodgeball tournament in March 2018, promoting mental health awareness. All proceeds from the event were donated to the Canadian Mental Health Association. In previous years, we have also held Ultimate Frisbee tournaments, with all of the proceeds going towards the Leukemia and Lymphoma Society of Canada. In 2015, we raised $4,500 dollars from this tournament. Our philanthropy events bring together the entire greek system with various other fraternities and sororities taking part, as well as other members of the UBC community. Philanthropy is something which we take seriously within our chapter, and we are always finding new ways to give back to the community. Whether it be growing out moustaches for Movember, volunteering at the Salvation Army christmas kettle drive, or giving our time to help with the annual Vancouver Sun Run each April, we are always looking for new ways to give back.